← Thank You For The Memories Jack! It has been a while since I gave an update on my triathlon training. Seems like after last year’s Carpinteria Triathlon, I went into hibernation. For one reason or another, it was simply time to slow down, deal with life and do some regrouping. So, the winter months were not exactly the most productive in terms of triathlon training. But, it wasn’t like I spent the winter in bed. In contrast to last winter where I spent quite a bit of time improving my physical side, this winter I focused more on the mental side. I spent time reflecting on 2009 and 2010 triathlon seasons, studying “the mental edge” and positive visualization. I learned a lot about what it meant to perform mentally whether during training or during a race. Two books helped me focus and provided some surprise inspiration. Two of the books, “Zero Regrets” and “Spirit of the Dancing Warrior” are summarized in my post, Some Inspiration: Apolo and a Warrior. The third book, Dan Millman’s Way of the Peaceful Warrior, is an interesting tale that parallels the other two. Simply by being focused, in control, and breathing calmly, one can become a warrior at everything they do. All three books have made me reconsider my approach to everything, but I am learning that becoming a warrior requires discipline, practice and even more discipline. However, when I achieve the warrior state whether swimming, biking or running, the results are fantastic. It is like I am transported to a land where gravity works with me, not against me and every step or stroke is pure bliss. The hard part is getting to that state, which requires one’s mind to let go of all thoughts, step above any muscle pain and focus on breathing. It takes practice. Speaking of practice, my physical workouts have been sporadic. Like I said before, life can be quite busy at times, especially during the holidays and end of year. 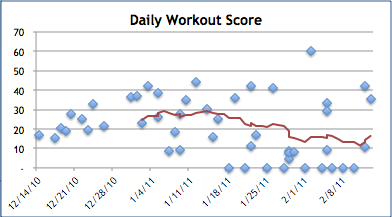 As you can see in the chart above, my triathlon training is rather inconsistent. Each marker represents a workout with the value being a function of time and intensity. Not only has the frequency of workouts dropped off, but also the intensity, starting in mid-January. In fact, February has been dismal with more zero intensity days since I was an office potato. The primary workout each week has been a cross training workout that combines strength with cardio training. The workout starts with intervals on the treadmill, then two circuits of strength and usually ending with more intervals on the bike or elliptical. Weekends would include a long bike, run, swim or combination of the three. I also started attending a group swim workout at the local pool, which proved to be highly beneficial. Not only is it a longer pool, at 50m, but very motivational as swimming with other more competent athletes really makes me push harder. My swim workouts have gone from 500-600 meters to well over 1 kilometer. So, what’s next? Keep moving forward. My first triathlon is the Ventura Triathlon at the end of June. This gives me plenty of time to build my competitive spirit and get back into shape. With the goal of completing the olympic course at the Carpinteria Triathlon in September, it is clearly time to come of hibernation and get going. Bears can spend an entire year in their caves! This entry was posted in analysis, Fitness, Goals, Running, Strength Training, Swimming, Training Charts, Triathlon Charts, triathlon training, Triathlon Training Dashboard, Weekly Summary, Workout Logs and tagged analysis, Swimming, triathlon training, Workout_Logs. Bookmark the permalink.